During the course of my writing the season preview for the Mid-Atlantic region of the NPSL, I was able to learn some interesting things about each club. However, while most of these things revolved around soccer, there was one piece that really drew me in and I had to learn more. Before I jump into that, I want to preface it with this. We all know that community outreach is a fairly large stable in professional team's operations, but it's less likely to see a large community footprint from amateur clubs. Most of this can be chalked up to the lack of resources an amateur club may have, but thankfully, more clubs are getting involved with the explosion of social media. 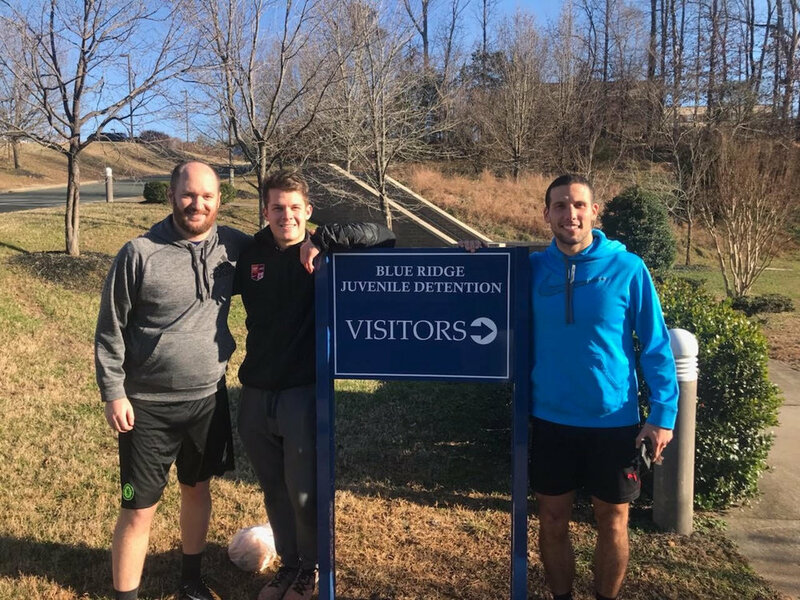 One club who has been a part of this upward trend on social media and in its local community is Charlottesville Alliance FC. Its owner, David Deaton, has been thinking outside the box in terms of community projects since the club was founded in 2014. One venture in particular truly stands out, the introduction of his club to Blue Ridge Juvenile Detention Center. While this breaks the overall general mold of community outreach projects, Mr. Deaton chose to take this path because it was something he hadn't heard of any club doing previously. When I got the opportunity to speak to David, I asked him how he came up with the idea of going into the detention center. He told me that it started with the why instead of the how. He explained that the team sprung up from a diverse group of people who entered tournaments together and did well. They also recognized that their biggest strength came from their diversity, but also knew that despite the diversity, they were all the same. From that moment on, they made it a point to give back to the community and stay involved with the community as much as possible. He and the team chose the detention center because the sister of one of the players worked there and could set up a meeting with those in charge. They also chose the center because they wanted to push the boundaries and social norms by trying to connect to these kids who felt they were on the outside of society and just wanted to be accepted for who they were. David told me, "Regardless of what these kids have done, they aren't forgotten or cast out by the community." He also went on to tell me that "these visits gave the kids a connection to the outside world apart from the ones they have with their families." However, while the team has gone to the facility multiple times, I found out that none of the kids have gone out for any tryouts with the team after they've been released. But, that fact wasn't mentioned in a discouraging way. It was meant as the team was helping introduce the kids to the sport and help them find ways to handle conflict and conflict resolution. Luis Grande is in blue. As for how the team feels about these trips, I was told it's one of the most loved things by the players. One player, Luis Grande, even echoed David's sentiments about the kids. He told me that the kids learn the players' names and even ask about players from previous trips who may not be with the team anymore. He also compared it to the youth outreach movement in his home country of Venezuela. "The top players in the world are coming from the streets, which can only serve to strengthen the bonds between the community and the soccer world," Luis explained to me. In addition to playing soccer with the kids, the players tries to interact as much as possible with the kids and help them open up about their lives. They also discuss future plans with the kids once they are released and try to make as positive of an impact on the kids' lives as possible. David did tell me that the proudest moment in the team's history (outside of on-field accomplishments) is when the team wrote a letter on behalf of a kid up for early release. By writing that letter and supporting the kid, the team was able to help him get his release. Now, the young man shows up to every match and is known by every player on the team. Additionally, he has stayed out of trouble and succeeded in life because of the faith the team had in him. This article was meant to mainly focus on a very unique community project the team started, I would be derelict in my duties as a writer to not mention their other community projects. David and the team play futsal weekly at the local Boy's and Girl's Club. He explained that every Friday night the attendance at the club spikes because the local kids heard the team would be there. Additionally, he told me that it helps bring in the most at-risk teens and helps keep them out of trouble compared to if they were on their own during the weekends. Another project that David has explained he hasn't kept up with is going into the local housing projects and interacting with the kids there. He stated that the first time he went to the area, he simply dribbled and juggled a ball waiting for some of the kids to come up and interact. Over the course of a few weeks, he said, more of the area youth started to show up and were playing pickup games. It allowed him to help these children develop conflict resolution skills they may not have gotten elsewhere and he stated that the reaction among the residents was generally positive. As we all know, there was a terrible tragedy that occurred in Charlottesville on August 12, 2017. Because of this, David and the team hold a twelve second moment of silence to honor the victims of that tragedy. "Ultimately," David said, "we not only want to continue to help our community heal after that devastating tragedy two years ago but also help bring our community together again and strengthen the bonds that have held this community up for so long." In the end, Charlottesville Alliance FC may only be a blip on the map of US soccer, but to those of us who care about lower league soccer, they are a reminder that there are plenty of ways to be involved in our communities. At the end of our conversation, David said, "We are more than happy to challenge the rest of the amateur community to do more within their communities." Never have I heard such a sincere and genuinely friendly challenge like this thrown down, but I hope that by telling this story, it will push more clubs to do more in their areas.